No one has time for the lethargy of flu. The economic effect, financial, physical and mental drain are astounding: around 100,000 Americans are hospitalized each year for flu, the World Health Organization reports. One of the commonly known mistakes people make is to swallow antibiotics, says pulmonologist Gustav Ferrer, MD FCCP, founder of the Cleveland Clinic Florida Cough Clinic. Antibiotics cannot combat viruses–only bacterial infections, says Dr Ferrer. Instead, drink fluids and look for non-chemical antidotes, derived from the plant kingdom, he adds. 1. Elderberry. An elderberry extract called Sambucol (Sambucus nigra L.) can short-circuit symptoms by inactivating the flu virus. A study from the University of Oslo in Norway shows it works for type A flu virus as well as influenza B. Sixty patients with flu symptoms no older than 48 hours were infected with type A and type B and given 15 millimeters of Sambucol four times a day for five days. Almost 90% of participants experienced complete cure within three days. The explanation for its effectiveness? Most likely, its immune-stimulating flavonoids, powerful antioxidants found in nearly all fruits and vegetables. Other compounds like anthocyanins boast anti-inflammatory effects, aid aches, pains and high temperatures. 2. Echinacea. Research published in the Virology Journal states Echinacea purpurea extract impedes the infectiousness of flu viruses by 99%. A team of researchers investigated five influenza A strains: H3N2, H5N1, H7N7, H1N1 (human influenza) and H1N1 (swine flu). What they learned was that Echinacea efficiently blocked the reproduction of influenza strains and swine-flu virus. 3. Goldenseal. Owing to its alkaloids, berberine and canadine, goldenseal root soothes irritated mucous membranes and inhibits growth of influenza A. Taken at high concentrations, the herb works as an antiseptic, eliminating inflammation and battling microorganisms in the body. Available in tablet, capsule and powder form, goldenseal should only be used sparingly to prevent any possible unfavorable side effects, which aren’t known due to lack of research on the herb root. 4. Astralagus. A member of the pea family, this perennial plant root is a popular medicine in China for use against flus and common colds. The Natural Medicine Comprehensive Database (NMCD) concluded that consuming astralagus long-term could prevent colds and seasonal allergy symptoms. Because astralagus is an antioxidant, some studies suggest it can lower cholesterol, improve heart health and even function as adjunctive therapy for cancer. 5. Xylitol. The nose is particularly vulnerable at letting bacteria invaders in. 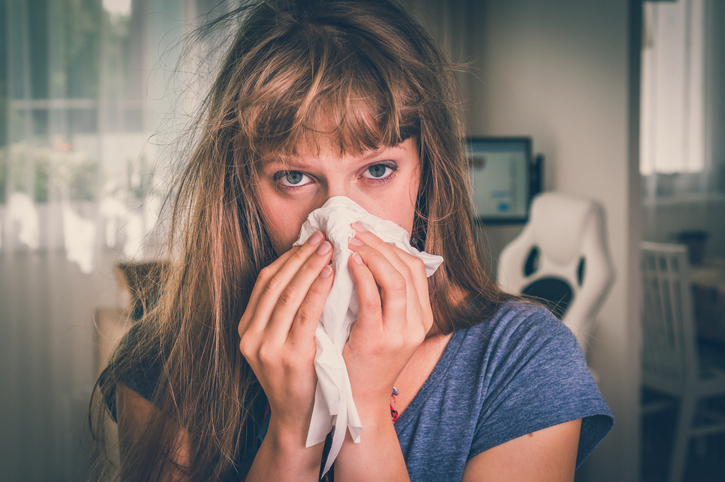 Once bacteria and contaminants stick to the mucous membrane in nasal passages, it is too late to prevent viruses from getting comfortable in our cells. But they don’t have to get too comfortable if we get into the habit of washing our nose as often as our hands. A xylitol nasal spray such as Xlear contains xylitol, a molecule that blocks viruses from penetration and functions as a cleanser for nasal passages. Keep a bottle in your handbag or at least in the medicine cabinet. Regular use reduces any possibility of invaders clinging to airways, arming us against flu. Xylitol should be used all year round and elderberry can be consumed at the height of flu season. Goldenseal and echinacea should be at help as soon as symptoms occur; and astragalus can be used year round for building immune protection.